Lip smacking good~! Robust and rich in seafood flavours, this Crab in the Bag dish will wow your dad this Father's day. 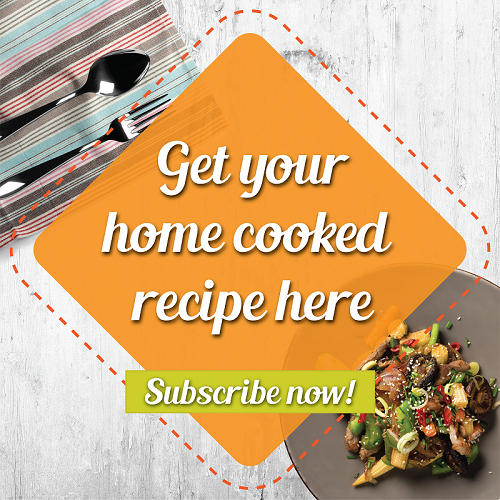 A recipe by home cook Adeline Oon, it is pretty easy to make and is definitely delicious! 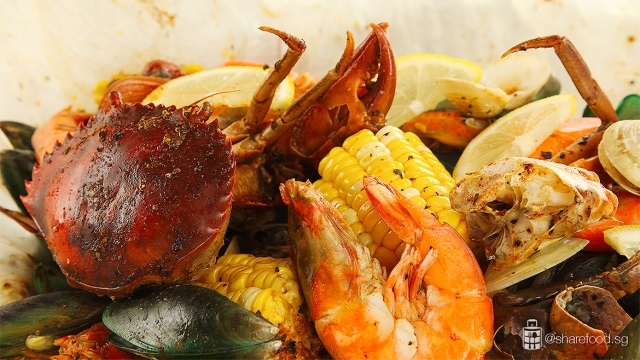 Seafood boil is a communal eating experience which is popular in America during the summertime. 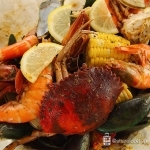 The dish consists of shellfish and other seasonal seafood that would be cooked by using preparation methods such as boiling, steaming or baking. When the dish is cooked, it would be served directly on the table of diners, and it is to be enjoyed with your bare hands. Crab in the Bag platter filled with crabs, prawns, clams, mussels and more! 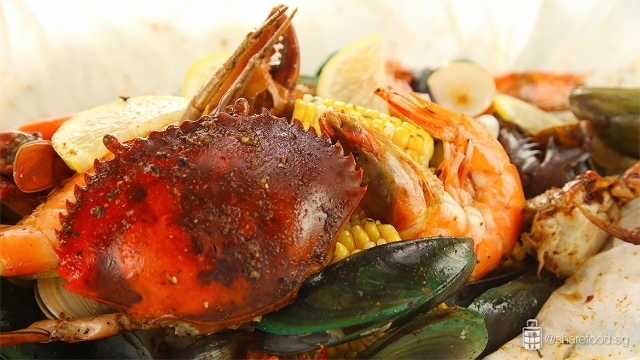 For our Father's Day recipe, we've picked a lineup of shellfish and seafood. 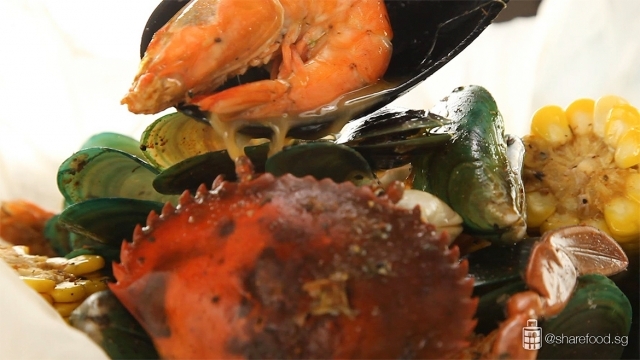 From crabs, prawns, clams, mussels to squid! Simply place all the ingredients in a huge pan or deep dish covered with parchment paper, pour the seasoning over, wrap it up and put it to bake! Robust and flavourful seafood broth! Enjoy everything with your bare hands! Skip on the table setting and utensils! This dish is served directly on the table, and everyone eats everything with their hands. 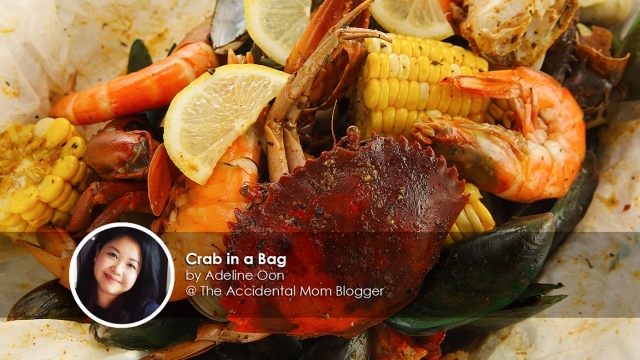 This Crab in the Bag dish is a hearty party meal that will bring everyone closer. Archive this recipe and cook this up for your Dad this Father's Day. Because the simplest gesture often means the most. Crab: Brush the shells to clean the exterior. 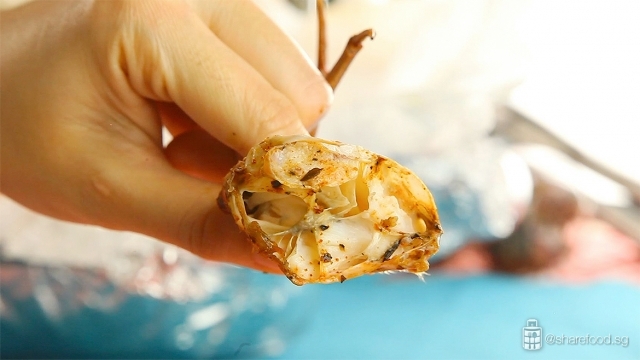 Remove the shell and quarter the crab. Crack the claws so that it is easier to peel off the shell. Alternatively, you may ask the fishmonger to dissect it for you. Squid: Remove the head and deskin. Cut the body into rings and rinse thoroughly. Prawn: Use a pair of scissors to cut off the antenna, legs and rostrum. Rinse thoroughly, do not soak in water as it flavours from the prawns would be less intense. Clams: Brush the shells. In a pot of hot water, add in clams. Once a majority of the clams have opened their shells, remove from water. #Tip: Rinse and toss to remove the sand. Dispose clams with unopened shells as they are not fresh. Mussels: Brush the shells. Allow the same pot of water to boil, add in mussels. Once a majority of the mussels have opened their shells, remove from water. Rinse in running water to remove the sand and peel off the impurities. Dispose mussels with unopened shells as they are not fresh. Mix all the seasoning in a bowl. In an oven-safe deep dish, lay aluminium foil and parchment paper. Add in all seafood. Pour the seasoning over it. Give it a good toss and top it off with butter. Wrap tightly and bake it for 50 minutes. Garnish with some lemon slices before serving. #Tips: Do not leave any openings before baking as to prevent the content from drying up. This also helps to lock in the moisture and give the broth the sweet seafood taste in the bag. 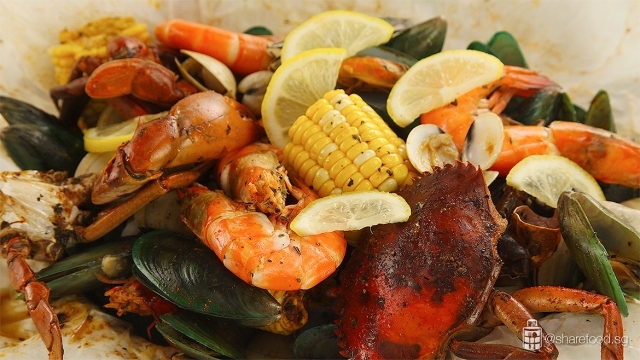 #Tips: It is cooked when you can smell the aroma of the seafood when you remove it from the oven!